Australia: The NBN is still a political “hot potato”, with its future and form intimately linked to the outcome of new Federal elections due to be held some time in 2013. Until then, Mike Quigley and his team forge ahead with true FTTH (Fibre to the Home). Should the right-wing Coalition win the elections, their communications spokesperson has promised to cut back on the overall cost (estimated at A$37 billion) by reverting to Fibre to the Cabinet and use the old existing phone lines for the last hop into the home or premises. I personally think this is foolish and retrograde. As Mike himself has stated, as a percentage of Australia’s GDP, the $37bn is far less than was spent by the Governments of the day on the telephone network, and also even less than was spent by the South Australian Government on their telegraph line. There are two very interesting presentations on this subject that you may wish to see/hear. They are http://www.abc.net.au/pm/content/2012/s3634680.htm and http://www.abc.net.au/lateline/content/2012/s3642410.htm. The latter link has a very interesting video on the two options. Please listen to my good friend Paul Budde’s arguments against the Coalition’s plans. I’ll let you make the conclusion…. New Zealand: This morning I stepped out of my apartment here in Auckland and discovered a flurry of activity right across the street. 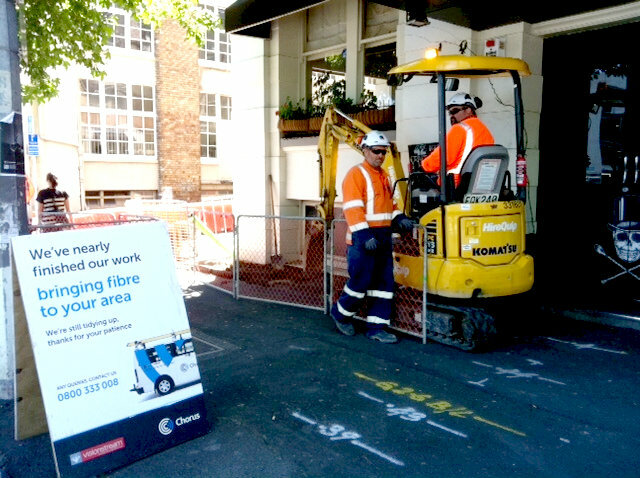 It was another of the many teams around Auckland pulling fibre cable through the underground ducts. Chorus and their contractors are really getting on with the job. Amusingly, as I took the photo with my iPhone, the guy standing next to the digger raced over and asked what I was doing. I gave him my best smile and said that I worked in the field of fibre optics networks and congratulated them for getting the job done. I then said that my photo would be posted on the internet immediately for many fibre professionals to see. Ah, that made him happy! He slapped me on the back and went back to work! So the Kiwi UFB is just quietly getting installed, no fuss, no political hot potato, very little criticism from any source. What’s amusing is that the Government currently in New Zealand is right-wing, and are doing exactly what Australia’s right-wing parties want to undo. Go figure! This is really well done, I’m not sure who funded it, or who Indiefilm is, but it’s another excellent and simple explanation of why we MUST replace our copper phone network with fibre optics. We don’t need it all overnight, it’s a long term project that will take perhaps 10 years to complete. But the benefits and necessity are undeniable. I will be spending Christmas “French-style” with my family in New Caledonia, then returning to Australia mid-January.